The CityDeck is the heart of a multi-phase redevelopment project along Green Bay’s Fox Riverfront, whose aim is to allow for significantly increased access to the river and to diversify social and ecological life along it. 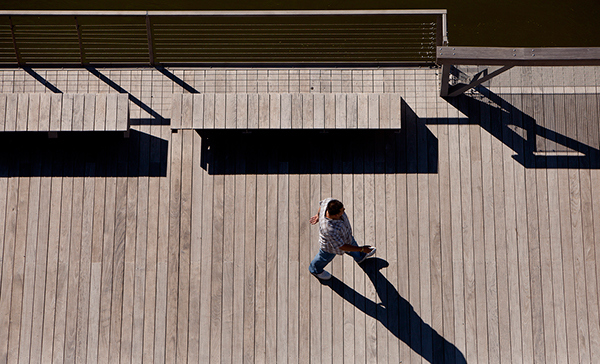 The boardwalk is activated by an undulating wooden surface that provides spaces for gathering, docking, watching, and playing. The sectional diversity creates a wide range of seating configurations and river overlooks. The boardwalk is designed flexibly, to accommodate both large and small gatherings comfortably, and for round-the-clock and year-round activity. The design inventively integrates sustainable stormwater, material, and lighting strategies; it reorients downtown to the riverfront; it frames opportunities for new development; and it creates an entirely new image for the City of Green Bay. Project planning and design involved intense public and stakeholder participation, as well as extensive coordination with local, county, state, and federal agencies. Phase 1 opened in stages in 2009 and 2010. Phases 2 and 3 are scheduled for completion in 2012-2013.